Balance exercises for seniors are used to become and stay healthier, stronger, and more active. Furthermore, balance exercises are important in preventing falls. Finally, balance exercises for seniors are doable around the house. 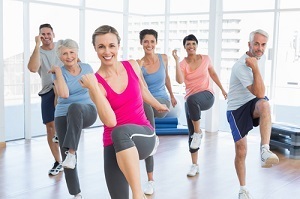 In addition, general information about exercises for seniors is available elsewhere. Also, other types of exercises, such as strength exercises, flexibility exercises and, aerobic exercises, are available to seniors. Single Limb Stance - First of all, stand behind a steady, solid chair (not one with wheels), and hold on to the back of it. Next, lift up your right foot and balance on your left foot. Furthermore, hold that position as long as possible, then switch feet. Most of all, the goal is to stand on one foot without holding onto the chair and hold that pose for up to a minute. Rock the Boat - First of all, stand with your feet apart, so that the space between them is the same width as your hips. Also, make sure both feet are pressed into the ground firmly. And stand straight, with your head level. Then, transfer your weight to your right foot and slowly lift your left leg off the ground. Furthermore, hold that position as long as possible (but no more than 30 seconds). Then, slowly put your foot back onto the ground, and transfer your weight to that foot. Finally, slowly lift your opposite leg. Start by doing this exercise for balance five times per side, then work your way up to more repetitions. Clock Reach - Imagine that you are standing in the center of a clock. The number 12 is directly in front of you and the number 6 is directly behind you. First of all, hold a chair with your left hand. Then, lift your right leg and extend your right arm so it’s pointing to the number 12. Next, point your arm towards the number three, and finally, point it behind you at the number 6. Now, bring your arm back to the number three, and then to the number 12. Most of all, look straight ahead the whole time. Finally, repeat this exercise twice per side. Back Leg Raises - This strength training exercise for seniors makes your bottom and your lower back stronger. First of all, stand behind a chair. Then, slowly lift your right leg straight back - don't bend your knees or point your toes. Next, hold that position for one second, then gently bring your leg back down. Finally, repeat this ten to 15 times per leg. Single Limb Stance with Arm -This balance exercise for seniors improves your physical coordination. First of all, stand with your feet together and arms at your side next to a chair. Next, lift your left hand over your head. Then, slowly raise your left foot off the floor. Now, hold that position for ten seconds. Finally, repeat the same action on the right side. Side Leg Raise - First of all, stand behind the chair with your feet slightly apart. Then, slowly lift your right leg to the side. Most of all, keep your back straight, your toe facing forward, and stare straight ahead. Next, lower your right leg slowly. Finally, repeat this exercise ten to 15 times per leg. Marching in Place - Standing straight between the backs of two chairs, first, lift your right knee as high as you can. Next, lower it. Now, lift the left leg as high as you can. Next, lower it. Finally, lift and lower your legs 20 times. Toe Lifts - First of all, stand straight behind a chair and put your arms in front of you. Now, raise yourself up on your toes as high as you can go, then gently lower yourself. Most of all, don’t lean too far forward on the chair. Finally, lift and lower yourself 20 times. Shoulder Rolls - You can do this seated or standing. First, rotate your shoulders gently up to the ceiling, then back and down. Next, do the same thing, but roll them forwards and then down. Hand and Finger Exercises - You don’t need to stand for these. In the first exercise, pretend there’s a wall in front of you. Your fingers will climb the wall until they’re above your head. While holding your arms above your head, wiggle your fingers for ten seconds. Then, walk them back down. During the second exercise, touch your hands while they’re behind your back. Reach for your left hand while your right hand is behind your back. Hold that position for ten seconds, then try with your other arm. Calf Stretches - To do calf stretches while standing, find a wall with nothing on it. Stand facing the wall with your hands at eye level. Place your left leg behind your right leg. Keep your left heel on the floor and bend your right knee. Hold the stretch for 15 to 30 seconds. Repeat two to four times per leg. If you want to stretch your calves while sitting, you’ll need a towel. Sit on the floor with your legs straight. Put the towel around the soles of your right foot and hold both ends. Pull the towel towards you while keeping your knee straight and hold it for 15 to 30 seconds. Repeat the exercise two to four times per leg. Find the full Tai Chi for Beginners program here: http://bit.ly/yt_Beginners The ancient practice of Tai Chi Is clinically proven to be one of the most effective exercises to improve health, fitness and relaxation. Tai Chi consists of fluid, gentle and relaxed movements suitable for anyone and can be practiced almost anywhere. Learn what Tai Chi is all about, why Dr Lam created this program, and the benefits you can gain from practicing Tai Chi for Beginners. The balance exercises for seniors described here, will prevent falls. Copyright text 2018 by FitnessReporting.com.